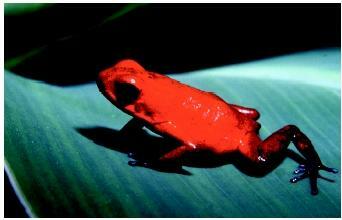 A strawberry poison arrow frog in Costa Rica. of terrestrial vertebrates). In a few species, the female retains the eggs in her body where they are nourished directly by her before she gives birth to her young, or they develop by absorbing their own yolk (a phenomenon also known to occur in at least one species of sea snake, class Reptilia).